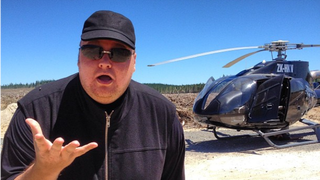 With the recent launch of Mega, Kim Dotcom has been on the upswing lately, at least when he's not getting stranded by a busted helicopter. Recently, he sat down with the Financial Times to discuss his status as a hero/villain, the future of content delivery, and the $20,000 he claims to have sunk into iTunes downloads. A huge part of Dotcom's business strategy has been claiming that his services aren't for piracy. Mega is encrypted for your security, and whatnot. And to show he's not a pirate, Dotcom told the Financial Times he's sunk a whole buncha cash into his iTunes purchases. Though to be fair, $20,000 is pocket-change for the dude. "You know I have never uploaded and shared a movie in my life," he says. "I have always bought all my content. I've spent over $20,000 in the past five years on iTunes. I'm not a pirate." ...Among reams of evidence, [The Department of Justice] cites emails showing what it says is wilful complicity in copyright infringement, including one from Megaupload's chief technical officer saying, "We're not pirates, we're just providing shipping services to pirates :)." Dotcom says the DoJ lacks a sense of humour. Suddenly he breaks off. "Is that a chicken in my house?" Sure enough, a large white chicken is strutting through the living room towards us. "That's a first. You can mention that the chicken came out when we started talking about Chris Dodd," he says, referring to the chief executive of the Motion Picture Association of America.